It seemed like a good idea at the time. I would trade my caramel ombre for an auburn ombre, something that would easily transition into the fall and winter months since I get my hair done approximately once every never. I really didn’t think twice about it (because apparently thinking once is not something I’m fond of, let alone twice) until my freshly dyed hair was being blown dry. Out of the corner of my eye, I saw wisps of very red hair and started to question my decision making skills. But even when I saw the results in the mirror, I didn’t think it was that red. Primarily because, along with being good at jumping hair-first into impulsive creative decisions, I’m also really good at denial. Which is why I didn’t realize I had red hair – red, red hair – until four days after it had been dyed. Four full days. As in one day longer than it took Jesus to rise from the dead. That is the level of denial I’m committed to. Necessary disclaimer: my hair dresser is phenomenal. She works wonders. She did exactly what I asked her to do, and she did it well. I just wasn’t prepared to have red hair. It should come as a great surprise because clearly I had thought through this situation in it’s entirety. Once I realized my hair was really red and I was really not even kind of on board with it, I decided to consult Google to figure out how to have hair that was less red without pulling a reverse Anne of Green Gables hair dye horror story. Ironically, I chose the one solution that sounded like it had the highest potential of turning me into an actual Anne of Green Gables hair dye horror story. Multiple sources told me it was a good idea to mix a few drops of blue and green food coloring with dish soap and shampoo. 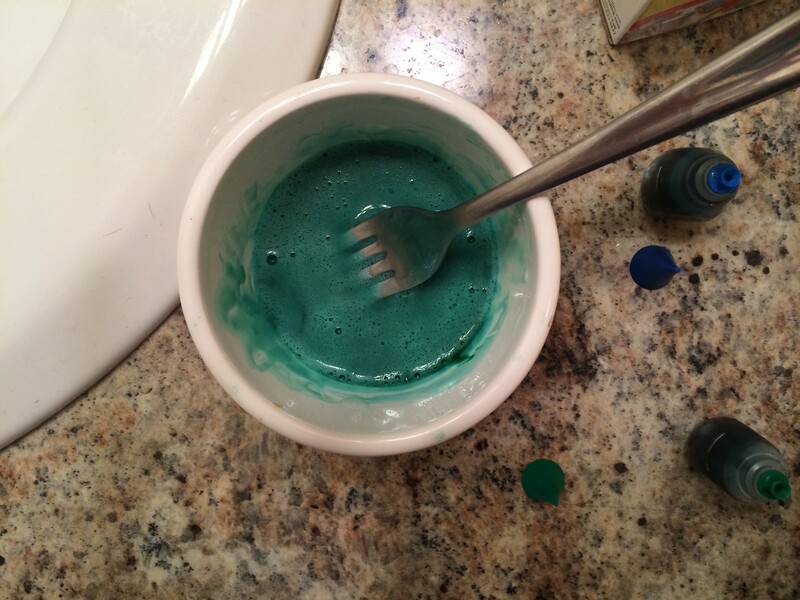 They said the blue/green food coloring counteracts the orange/red dye. While it makes sense on a color wheel, I was less confident that it would make sense on my head. But the prospect of remaining a very red redhead seemed like the greater evil, so I mixed away and went to work. I tried the concoction out on a small section first – one of the better decisions I made in the 96 hours in question. Since it didn’t turn my hair Green Gables Green, I decided to try it out for real. I shampooed with the food coloring mix, shampooed with just shampoo, and blow dried my hair with a level of intensity that would have frightened Attila the Hun. I was fairly anxious to see the results. And the results seemed promising! I couldn’t tell if it was optimism or denial or reality, but I thought the red looked a little bit darker! So I did what any normal person would do. I repeated the process seven times in less than 24 hours. You are thinking that sounds crazy, and you are correct. It was crazy. It was also crazy effective. I’ll let the photographic evidence take it from here. From left to right: at The Spur Of The Moment, later that day (holding Dylan! ), after a few washes, after all of the washes. I hide it well, but I was mildly relieved to return to being brunette, now with a hint of auburn. Note to self: make fewer impulsive decisions that require long-term commitment. And aim to completely avoid those that require the aid of food coloring. Oh that was just so good. Thanks for making me laugh! So glad the post was helpful, Aimee! Hope it worked out for you too! hi, my dyed brown hair is fading to a reddish brown and i was hoping that the food coloring method will work for me. I’ll have to try this as soon as I can get my hands on blue food coloring. Your “after” results look great! so did you this food coloring and shampoo on your wet dry or damp hair? Hey Dina! Hope you’ve had better luck by now, but my bubbles were fairly blueish-green. Good luck! Hi Beka. Great idea. I am also thinking about how to do this. How many drops would I need to used of each and how long to leave on conditioner? Hey Tes! I just used a couple of drops of each color – barely 2-3 drops – each time. I let the conditioner in for as long as I normally would – just a quick minute or so. Hope that helps! i just recently bleached the ends of my hair to create a ombre look but prior to that i was a Burgundy/reddish color. . and now in my blonde there is red tint to it. would i just mix the dish soap & shampoo with the blue/green food dye? and then just wash it out like regularly and just conditioned it till i get the color i want? That’s what I did, Carolina. Not sure how it works with blonde hair, though, since I’m brunette. Good luck! 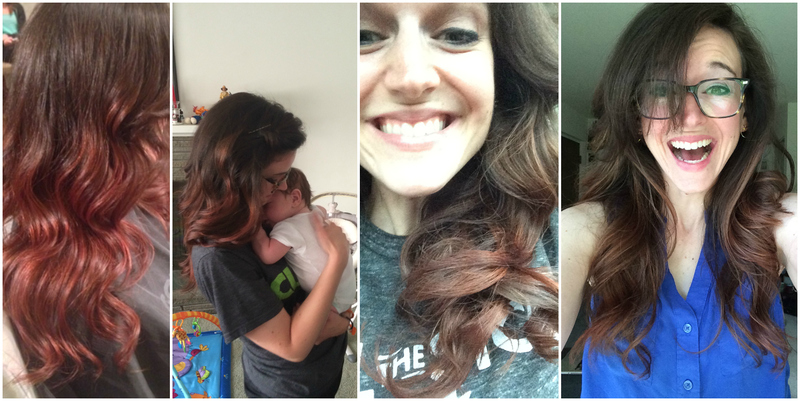 I had a home dye disaster…you always say never again, and then do it again! My dark blonde turned orange. I went to a hairdresser, and she rescued it but the sun of summer has made the orange come back. Never became today and I bought a semipermanent light brown….and I’m auburn! Contempting giving the green food dye a go. How long did it last? Did you have to keep doing it? Thank you!!!! Oh, dear. I’m so sorry, Amy! Mine turned auburn after the process described in this post and then the reddish tones in the auburn gradually faded over time. Good luck! Beka, this has been an absolute delight to read! I have a quick question. Did you find that your hair had a green tinge at all at any point during your washing process? Also, is this a process that you have had to repeat in order to keep the red at bay over time? Oh my god! My friend just linked me this and said “I honestly thought this was your post” – and I can see why… you sound exactly like me! It’s bizarre. I’ve just purchased five bottles of green food colouring because I had to have my hair dyed red twice just to be absolutely sure I don’t want red hair. So here I go again…. How long did you leave the food colouring/shampoo mix on your hair for??? This is a good idea. Mix a couple of drops of green food colour into a clear shampoo (to get rid of excess red) and/or a couple of drops of blue (to get rid of yellow gold. If it’s not enough next shampoo put in 4 or slightly more, don’t over do it though. Leave for a couple of mins, then rinse and condition. Repeat as necessary over a few weeks (Elle – professional stylist, UK). Good luck! I have been using Joico’s color balance blue shampoo and add about 4 to 5 drops of green food color for several weeks now It has gradually lightened the ugly red / orange/ rust color in my normally dark blonde hair. In turn it has also lightened some of my dark blonde hair . It now looks like my dark blonde hair as medium blonde/ strawberry blonde highlights. All I wanted to do was wash that gray right out of my hair and ended up washing a carrot top right into it. I struggled for months with the purple shampoos thinking that’s what I need because I have blonde hair. I even tried to re color with a dark blonde ash tone and it didn’t help at all.. I think it made it look more like a rust color. I didn’t think the blue would work for me because I have blonde hair.. Man was I wrong and I wish I had done this sooner.. I found the blue shampoo at Alta’s beauty supply. It doesn’t dry out my hair like dish soap would. Omg you are hilarious!! ? Haha I love you, you are just like me!! My “beige blonde” is green, and I will be doing red food colouring. Lets hope my results are as positive as yours! I know this was so long ago but the exact same thing jist happened to me! Did the red food coloring fix the greenish tint from your hair? So I don’t air that it didn’t work the first time that you had to repeat it 7 more times? How long do I leave it on for? Please advise as I’m also thinking of doing the same without having to do it that many times.